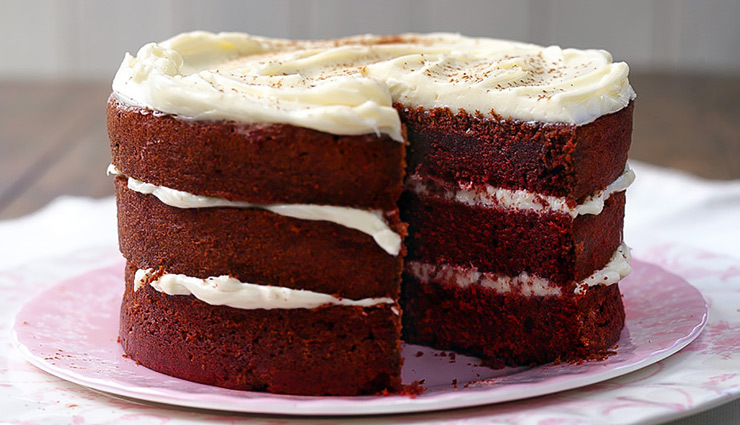 Everyone should have a good red velvet cake recipe in their back pocket—and this is it. It has a decadent chocolate flavor and the creamiest cream cheese frosting. * Preheat oven to 350°. Line two 8" round cake pans with parchment paper and grease with cooking spray. In a large bowl using a hand mixer (or in the bowl of a stand mixer), beat butter and sugar until light and fluffy. Add eggs one at a time, beating well after each addition then add vanilla. * In another large bowl, whisk together flour, cocoa, baking soda, and salt. Add half the dry ingredients to wet ingredients, beating until just combined. Add buttermilk, vinegar, and red food coloring, beating to combine. Add remaining dry ingredients. * Divide batter between prepared cake pans and bake until a toothpick inserted into the middle comes out clean, 25 to 30 minutes. Let cool 15 minutes, then invert onto a cooling rack to cool completely. * Meanwhile, make frosting: In a large bowl using a hand mixer (or in the bowl of a stand mixer), beat cream cheese and butter until smooth. Add powdered sugar and beat until light and fluffy. Add vanilla and salt and mix until combined. Add more powdered sugar, 1/4 cup at a time, if necessary, until frosting is thick and a nice spreadable consistency. * Assemble cake: Using a serrated knife, level tops of cakes, reserving the scraps for decorating. Place one layer on cake stand or serving platter, then top with a thick layer of frosting and second cake layer. Frost top and sides of cake. Crumble reserved cake pieces and press onto sides of cake.